Here are some facts about John Constable. John Constable was an English Romantic painter and landscape painter. His most famous work is The Hay Wain, painted in 1821 and now one of the most popular of British paintings. Constable was born in Suffolk in June, 1776 and painted many landscapes around his home. The area is now known as Constable Country and has a walk taking in some of his haunts. He worked in his father’s corn business when he left school, although he studied art when his father gave him an allowance. In 1802 he turned down a teaching position, choosing to paint instead. At first he painted portraits just to make money. He made trips to the Lake District and spent time sailing on a ship, to get inspiration for his work. The first important painting Constable sold was the White Horse. During his lifetime, he sold only 20 paintings in Britain, but sold the same number in just a few years, in France. John Constable married Maria Bicknell in 1816, despite her parents opposing the marriage. When she died in 1828, he decided never to paint again, although he later changed his mind. In 1829 at the age of 52, Constable became a member of the Royal Academy. He gave lectures on landscape painting and criticized the then current Gothic Revival movement. John Constable also painted many watercolours, including one of Stonehenge. He studied clouds and their effects on the landscape, determined to understand the science behind them. 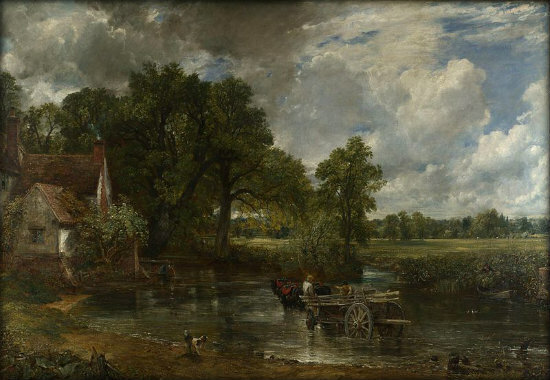 Constable’s painting the Hay Wain can be seen today in London’s National Gallery. A house belonging to Constable’s neighbor can be seen in the left of the painting. John Constable died in March, 1837 from heart failure. He was buried in St. John’s church, Hampstead, London, where his wife and two of their 7 children are also buried. What next? Discover more facts about other famous artists. I live in Suffolk too! We’re studying about him in fact! In art. And we’re trying to paint clouds and skies like he does. Thanks for catching the typo. I’ve just corrected it.